If you live in a place where some serieous air conditioning is required because of the high temperature, you will appreciate this new release into the Amaranthine Voyage series. 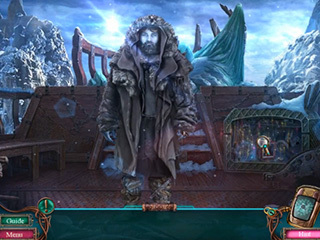 Amaranthine Voyage: Winter Neverending Collector's Edition takes to a different world where your help is urgently required. It is a fun sci-fi story with a few twists and turns. And the bonus chapter offers you a separate adventure. The top notch scientist Eve Glover is back and about to be challenged in the world of Corra. She received a signal and jumps right into the portal to see what can be done. She arrives to this ever cold world that relies heavily on Pylon as the source of energy. It requires an annual ceremony of appeasing called "unthawing ceremony". There is a special group of people that choose another special group to do the ceremony. But this time whenever the chosen ones where pointed out, they disappeared. This will begin the investigation that seems to be an simple one, but will take you all the way into the underworld. It is a fun sci-fi story with a few twists and turns. And the bonus chapter offers you a separate adventure. The game is going to be quite entertaining for those new to the genre, but the players who have played this series before, are not going to be thrilled. It seems that the series is a bit stuck on the same level of the gameplay. 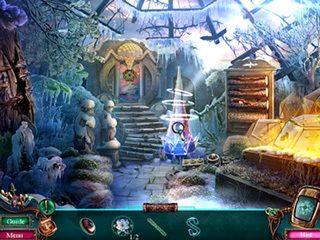 There is not really much changed in the hidden object scenes or mini games department. The game play is presented in four different modes: Casual, Challenging, Insane, and Custom. The hints are adjustable from 10-120 seconds, and the skips go from 10-400 seconds. You get a map and a strategy guide as you play. There is a souvenir room. There are 16 achievements to keep you real busy. You are to collect 42 signs and 12 morphing objects. 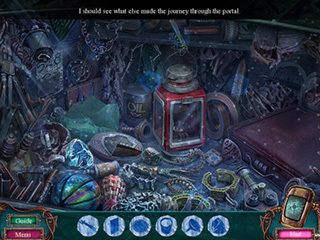 The puzzles and the hidden object scenes ar replayable. There is a bubble shooter that you can play instead of the hidden object scenes. Those are diverse, but very similar to the HOP scenes in the previous game of the series. There are the usual media extras (video, concept art, and wallpaper). The game would be fun and interesting to the those new to the genre, the rest might want to check out the free version to make sure they know what they are getting. This is Amaranthine Voyage: Winter Neverending review. Download this game here.